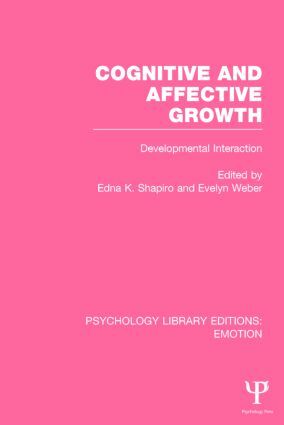 Originally published in 1981, this title is a collection of chapters based on papers presented at a conference called to explore what the editors called a developmental–interaction point of view – an approach to developmental psychology and education that stresses these interactive and reciprocal relations. The contributors, although from diverse professional backgrounds, are united in their commitment to an integrative view of developmental phenomena, one that highlights relationships among different aspects of development and the reciprocal nature of relations between people and their environments. Preface. Conference Commentary. Part 1: The Evolution of the Developmental-Interaction Point of View 1. Barbara Biber The Evolution of the Developmental-Interaction View Part 2: Interrelations Between Cognition and Affect: Three Views 2. Jan Drucker Developmental Concepts of Cognition and Affect 3. Herbert Zimiles Cognitive-Affective Interaction: A Concept that Exceeds the Researcher’s Grasp 4. Margery B. Franklin Perspectives on Theory: Another Look at the Developmental-Interaction Point of View Part 3: Reciprocal Relations in the First Years of Life 5. Sibylle K. Escalona The Reciprocal Role of Social and Emotional Developmental Advances and Cognitive Development During the Second and Third Years of Life 6. Leon J. Yarrow Perspectives on Interactional Research Part 4: Questioning the Role of Developmental Stage Theory 7. Edna K. Shapiro and Doris B. Wallace Developmental Stage Theory and the Individual Reconsidered 8. Evelyn Weber Stage Theory and Curriculum Development Part 5: The Nature and Development of Gender Differences 9. Jeanne H. Block Gender Differences in the Nature of Premises Developed About the World 10. Dorothy Z. Ullian The Child’s Construction of Gender: Anatomy as Destiny Part 6: The Development of Children’s Awareness of Intrapsychic Processes 11. Robert L. Selman What Children Understand of Intrapsychic Processes: The Child as a Budding Personality Theorist. Author Index. Subject Index.